I was watching a sitcom where six friends were hanging out, eating Chinese food directly from the takeout boxes, when I thought "I miss Chinese takeout!". (Which is absurd, considering I now live in Singapore, where delicious, authentic Chinese food is an obsession.) Our favorite takeout meals - Wonton Soup, Chow Mein, Egg Rolls, General Tso's Chicken - were Americanized versions of dishes whose authenticity didn't really matter. Was it the ease of ordering a complete dinner, on days where the rest of my afternoons were spent ferrying the boys from soccer to tennis to baseball practices? Was it the thrill of reading your fortune from a little cookie, no matter how ridiculous the prediction was? Or was it that the food came ready-to-eat, packaged in neat, little rectangular boxes - no dirty dishes or greasy pans to wash? 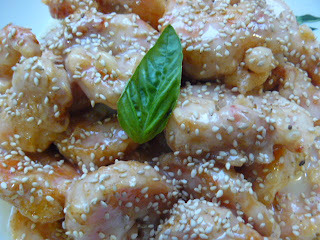 Whatever it was, here's a recipe of another takeout fave, Honey Walnut Prawns. The version I made for dinner omitted the walnuts (I didn't want to bother caramelizing them, actually), so I just sprinkled some toasted sesame seeds on the dish instead. 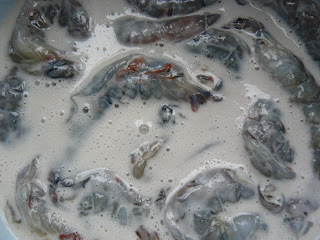 Make sure to pat the prawns dry after peeling and deveining, so the batter stays crisp. Rinse walnuts, then boil in 5 cups water, continually changing water until clear.When clear, boil with sugar until sugar dissolves.Heat 2 cups oil until almost smoking, then deep fry walnuts until they're shiny and brown, no longer golden.Place walnuts on cookie sheet, let cool. Mix cornstarch and egg whites together to form a thick, sticky texture and mix well with Shrimp. Set aside. 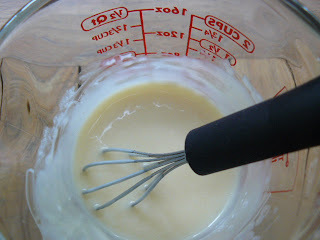 Mix honey, mayonnaise, lemon juice, and condensed milk in a medium bowl until smooth. 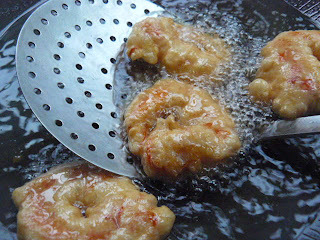 Heat oil until boiling, then deep fry the shrimp until golden brown.Drain, then fold in honey mayonnaise mixture. Mix well, sprinkle with walnuts, and arrange on platter. Love, love, love honey walnut shrimp. Thank you for sharing. I can't wait to try this. Hi Joy! I love the sweet-salty flavor and crunch that the walnuts give this dish, so you really should try the recipe with it. A winner!